Party Time! The 6th Anniversary Party is fun! I must say that there is a certain relief that the festival is nearly identical to last year’s festival. Any deeds or quests or goodies that you didn’t get to do last year are still available. There is one exception: there is a new Reveller’s Wasteed appearance to be found in the envelopes quest in Bree. Most importantly, there is nothing broken, which is a big achievement versus some of the festivals last year. I had the Reveller’s Gilded Horse from the store last year along with a matching outfit that I wear only on special occasions. The Reveller’s Gilded Horse is very fancy! 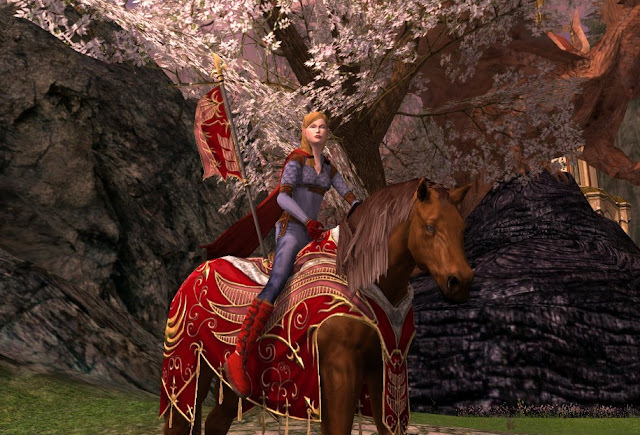 It is one of my go-to horses I ride on momentous events such as the first time I rode to Rohan. So, when I learned that the Warsteed appearance would be in the envelope quest, I knew I wanted it. This post was going to be a tallying exercise, showing how many Mithril coin resets it took to get the Warsteed appearance (yes, this quest resets at the cost of 5 mithril coins). I even had some clever titles in mind, such as “how many licks does it take…” or “can I buy a random drop?” However, unlike my typical unlucky rolls, I got the Warsteed Cosmetic Set for Reveller’s Gilded Appearance to drop after only 3 resets total across the first two days. The Warsteed Cosmetic Set, when dropped, comes in a Bound box. Opening the box gives you the Reveller’s Gilded Halter, Caparison, Saddle, and Accessory. None of the Reveller’s Gilded Cosmetic Set is dyeable in any way; you either like the bright red or you don’t. Reveller’s Gilded Horse: Here is the Reveller’s Gilded Horse. He is obtained from the lotro store only. This horse does NOT drop from anything in-game. I included it in this set as a reminder of what it looks like and for those who are thinking about buying it as it is on sale in the store right now for the next few days! As with any steed in the game, do remember to come visit them in the All the Steeds Gallery. 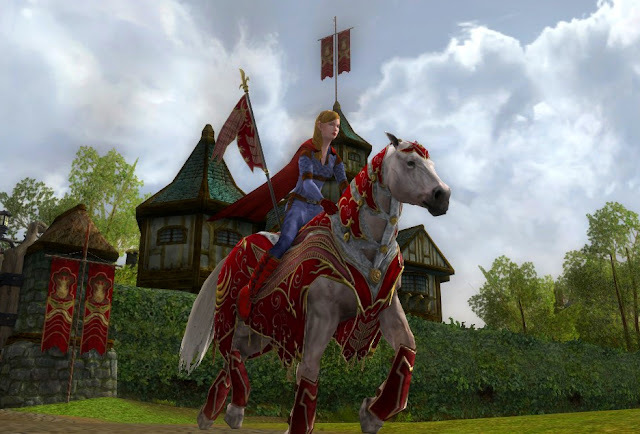 Reveller’s Gilded Warsteed, Chestnut Hair: The Reveller’s colors are very light with gold trim (hence the name “Gilded”) and I probably liked the White hair the best. However, this Chestnut color with dark Chestnut mane looked really nice as well. I pulled his hat off to show off the shiny mane. 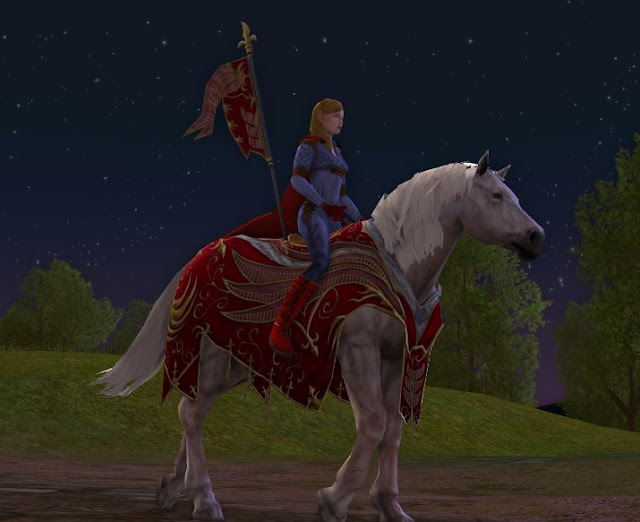 Reveller’s Gilded Warsteed, White hair, no leggings or Halter: The set comes with no leggings; I pulled the hat off while we rode home to get ready for the Party. 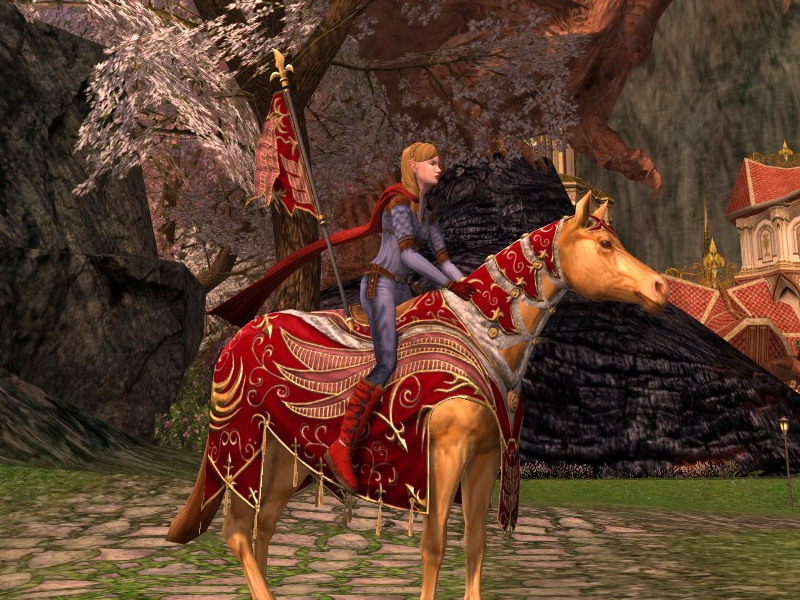 Reveller’s Gilded Warsteed, Party Dress: Getting this beautiful Warsteed was a special occasion, so time to change out of Supergirl attire and dress up. I watch the sun set on Falathlorn after changing into my Reveller’s Party Dress (lotro store). 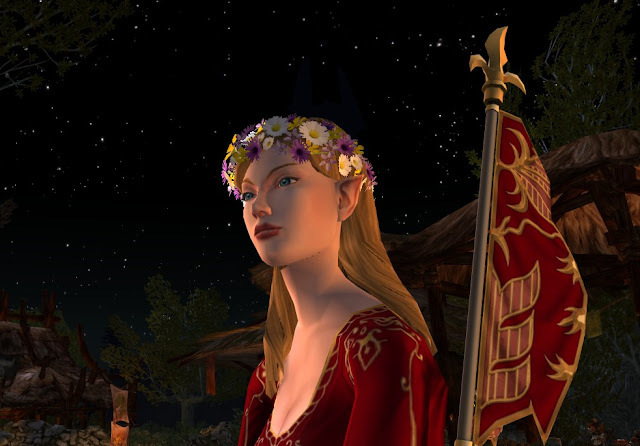 A Circlet of Fresh-Picked Flowers (Farmer’s Faire barter) completes the ensemble for me to go enjoy a night of Party time at the Anniversary festival. Cheers to you and may your Steeds carry you safely home! this dropped for me on this mornings attempt :) too bad I'm about 30 levels away from a war steed XD oh well it goes into the vault under 'things to use when I grow up'. Also if you act fast you can get the on sale mounts from last week (the class mounts) for an extra 25% off by using this week's sale code (cart13). Premium mounts with war steed cosmetics for 45% off? yes please! @ Lothirieth... Cheers and good luck! Yay Alysia! If you open the box, the 4 pieces of cosmetic should then appear in your bag. If you right-click-use each of those, they should go into your "warsteed cosmetic list" even though you cannot see it yet. 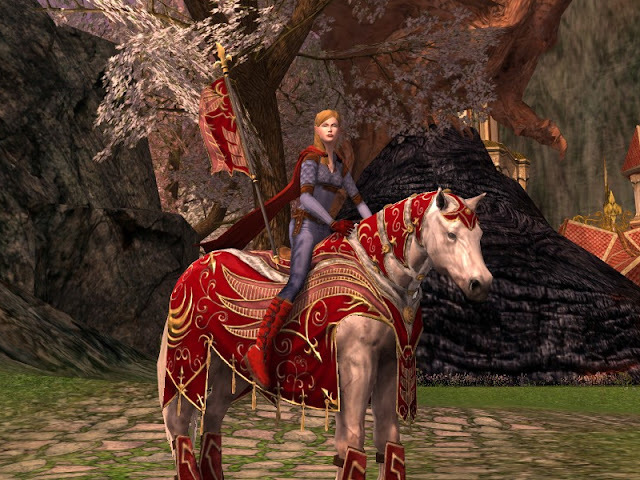 Danania I got the minstrel steed (kinda had to haha) and the loremaster steed as well as the revelers steed + cosmetic outfits. All in all around 3500TP *dies* oh well, no store steeds for a while. Definitely too bad that they aren't Account Bound. Aww Mz. :( Rotten luck. Random Luck Generator is one of my biggest pet peeves about the game. Similarly, I have been searching for the Red Painted Skeleton Horse in the lootboxes... ~ 86 boxes and no horse yet. Sorry, I feel your frustration. Here's to hoping that you have a good run of luck in the near future to balance it out.